Tent peak climbing has always been an attractive challenge for the climbers. Not only the peak but also the approach trek to Annapurna base camp is ever popular for its great mountain scenery. The trek ascends through beautiful river valley of Modi Khola, passes through interesting Gurung villages , beautiful terrace farms and high waterfalls. The Tent Peak(Tharpu Chuli) lies at the heart of Annapurna sanctury with some other attractive peaks like Hiunchuli and singuchuli. The surrounding mountains as well as the scenery from the summit is simply superb. The good thing about tent peak climbing is, it can be combined with Annapurna base camp trek. The usual route follows the north-west ridge to the summit. 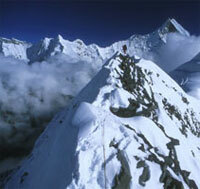 Several groups have also climbed the peak via the south-east as well as south-west face of the peak. Tent peak climbing is a challenging climb involving face climbing as well as tiptoeing on knife edge ridges. While climbing you will be surrounded by some of the highest mountains of the world and their hanging glaciers. Day 05: Pathana Landrung Village 1,646m. Day 06: Landrung Village Chhomrong 2,030m. Day 07: Chhomrong Himalaya Hotel 2,700m. Day 08: Himalaya Hotel Machhapuchhre Base Camp 3,757m. Day 09: Trek to Annapurna base camp 4,130m. or Tent peak B. C. 4400m and rest. Tented Camp. Day 10: Ascend to Tent peak high Camp, 5000m (approx)Tented Camp. Day 11: Tharpu Chuli (Tent Peak 5,663m.) summit then back to Annapurna base camp. Tented Camp. Day 13: Himalaya Hotel Chhomrong Village. Food and accomodation in tea house lodges for the clients in tea house lodges . Accomodation on tented camp during climbing, food cooked by our camp cook.